Uniquely formulated for women, this complex of Food-Grown® vitamins and minerals, whole-food nutrients and herbal extracts has been formulated to optimize your protection against free radical damage (or oxidative stress), for health inside and out. For women with demanding lifestyles, living in urban areas and for extra immune support. 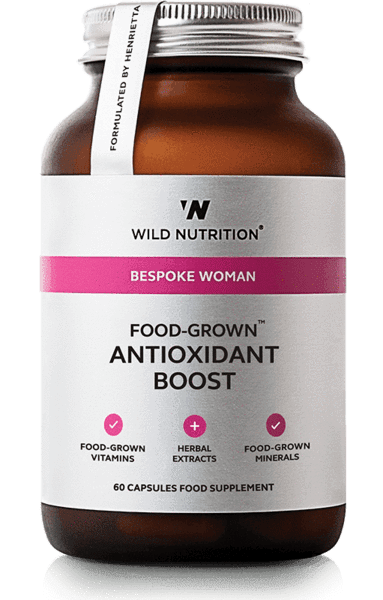 Our Food-Grown® Antioxidant Boost has been formulated especially for women using ingredients with exceptional antioxidant properties to maximize your protection against free radical damage. An excess of free radical damage (or oxidative stress) from nutrient-low diets, environmental pollutants, stress or illness can result in damage to cellular DNA and speed up the ageing process. This can influence the health of your skin, bones, hormonal balance and immune defenses. Increasing your intake of antioxidants plays an important role in protection against premature ageing and the development of degenerative diseases. Women may require additional antioxidant support at specific times in life such as in fertility preparation, menopause or in the management of hormonal equilibrium.